The hall offers flexible meeting areas and an integral domestic style kitchen, which will allow for catering and self-catering during events. 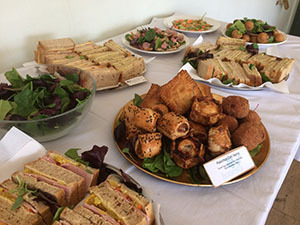 Catering can be arranged to meet all budgets from cold buffets to a full three course cooked meal using seasonal organic produce. Vegetarian options are included and a vegan option can be discussed. Our vision is a world which meets the nutritional needs of current and future generations with safe, affordable, high quality food, produced in a way that sustains and enhances the natural environment, and ensures the health and wellbeing of all. All tea, coffee, milk, sugar and fruit juice supplied by us is organic and where appropriate Fairtrade certified to ensure that farmers get a fair price for their produce. 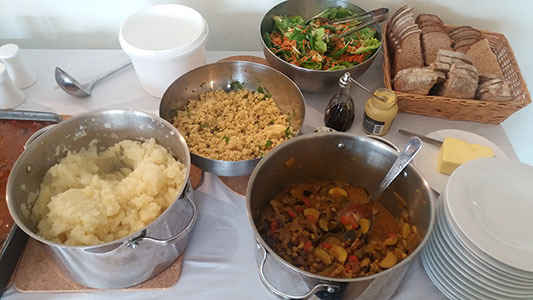 We have asked our caterers to us organic, fair trade and local ingredients, wherever possible. We try to keep all packaging to a minimum and to use biodegradable/compostable or recycled material wherever possible at all times. We can make the catering arrangements for you. 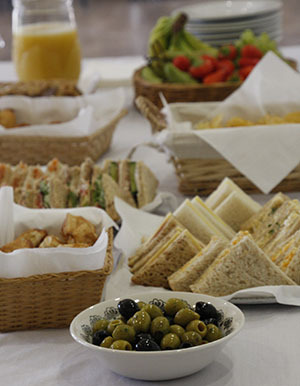 Our caterers include: Honesty Group.